I probably wouldn’t have remembered this album had I not spotted in a $1 bin at Sonic Boom Records. Given the shoddy condition of the record, even $1 was a bit steep. But I bought it anyway because, like any 8-year-old in 1980, I was enamored of Pac-Man, and “Pac-Man Fever” rode that zeitgeist to the upper reaches of the music charts. I pleaded with my parents to let me get this album, but they considered video games no better than gambling machines. And they weren’t about to encourage anything that wasn’t practical or useful. Pac-Man, however, planted a seed that pretty much resulted in the living I make today — computer programmer. It wasn’t just about the thrill of gobbling up the pellets, powering up to eat the monsters and reaching even higher levels of skill. It was the artwork on the cabinet. It was the mechanics behind the game. One of my siblings subscribed to a science magazine that featured Space Invaders on the cover, and it gave an overview on how video games work. There’s this grid, you see, and there’s some logic the computer calculates so when one object encounters another in that grid, the player earns a point and an invader gets vaporized. Or your ship goes kaboom! I wanted to learn how to make that grid and those objects and those explosions. But my parents could tell that if they bought me a computer to pursue that ambition to create my own video games, I would spend all my waking hours in front of that contraption. So they refused. Pac-Man Fever, like Uncle Vic’s “Space Invaders” before it, receded into memory. I don’t know if my parents were relieved that I wouldn’t take up gambling — remember, that’s what video games were in their mind — but instead, they bought a piano when I developed an interest in perhaps taking lessons. They hoped I would learn songs from the Great American Songbook, the music of their youth. I wanted to be Nick Rhodes or Martin Fry. So by thwarting my early interest in computers, my parents redirected that zeal to music, which would make them even more nervous a decade later when I declared music to be my major in college. The Internet eventually steered me back into the world of programming, but it was Pac-Man that primed the pump. I somehow taught myself BASIC even without a computer, and I got solid B’s in the rudimentary programming classes in high school and college. The interest was there if the opportunities weren’t. My parents’ prediction did come true. Once the Internet had its hooks in me, I’ve been parked in front of a computer ever since. 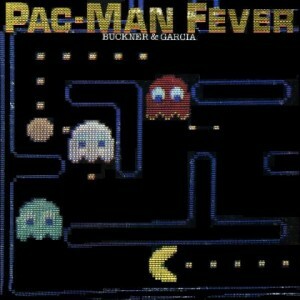 As for Pac-Man Fever, the album, I was quite surprised. Novelty albums usually aim for the quick laugh, but Buckner and Garcia have enough love for their subject matter to craft a set of tuneful songs. Synthesizers were still very much analog at that point, and new wave hadn’t yet made the jump from across the ocean. So instead you get some futuristic rock that serves as a pivot from Styx and Toto to Kraftwerk and the Human League.